Many think March Madness refers to college basketball and the NCAA Tournament. Many CPAs think March Madness refers to the mid-point of tax season and the corporate tax deadline on March 15. At the MACPA, we think of March Madness as the legislative crossover deadline, which fell on March 18 this year. This is the deadline set by lawmakers for a bill to pass either the House or the Senate to have a chance of clearing both chambers and making it to the governor’s desk. The great news is that both of our firm mobility bills were passed. HB 1081 passed house unanimously (139-0) and SB 513 passed the Senate unanimously (47-0). 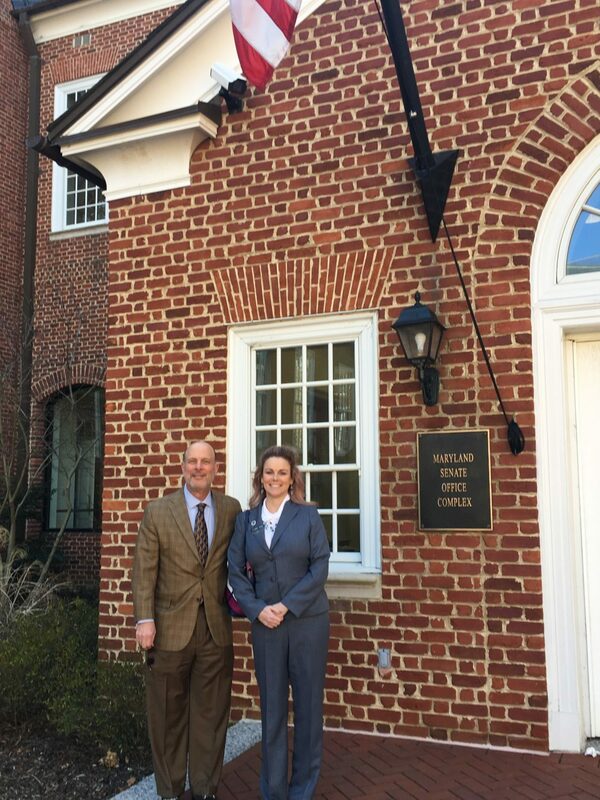 Pictured are MACPA board member Mark Cissell and our chair, Samantha Bowling, outside the Senate before testifying. That means we expect both to complete their journey and get signed into law by Governor Hogan after session ends on April 8. Overall, it’s been a good session, with our major issues of liability (comparative fault) and sales taxes on services not showing up. The employment issues are coming as expected, with most coming in fast and furious. The overtime bill (HB 1040) came in for the third year and was defeated soundly in committee. So far we have testified on 20 bills and are monitoring an additional 18. Here is the scoreboard as of today. Pass CPA firm license mobility: This also helps minimize the deregulatory risk issue. House Economic Matters, HB 1081 (sponsored by Del. Lorig Charkoudian, D — District 20, Montgomery County): Passed the House of Delegates. Senate EHEA, SB 513 (sponsored by Sen. Arthur Ellis, CPA, D -District 28, Charles County): Passed the Senate. Stop excessive data protection and privacy legislation: HB 901 / SB 613, Online Consumer Protection Act: Stalled and will monitor these after crossover. Stop onerous employment issues and laws (NDAs and non-competes): SB 328 / HB 0038: Passed with our amendments; wage history, SB 738 / HB 634: We testified, with no action yet. Ban the box: SB 839 / HB 994: We tried an amendment and expect this to pass.